We offer full-color LED Signs (better known as electronic message boards). We now offer electronic message boards. LED (light emitting diode) technology is a low-voltage, very bright light away to advertise. Our LED cabinets are for both indoor and (most common) outdoor use. The steel cabinets are water tight and weather proof with a power coat finish. They have built in ventilation systems with front-access to all internal components. The overall screen is broken up into individual LED modules that are changeable (in the odd case of damage). Our LEDs are plug and play, meaning you connect to a 120 volt power source (electrical outlet) and are ready to program. We include a brand new laptop, pre=programmed with LED controller software. We also offer complementary initial training and 24-7 tech support. We install remote control software (Team Viewer) for the laptop so a technician can log in and train you, and test/repair and issues from headquarters. 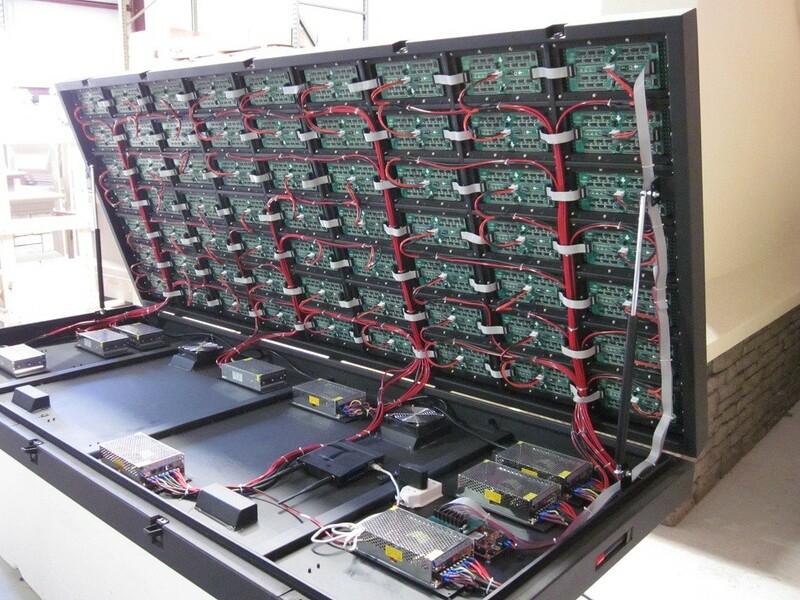 Our LED cabinets are easy maintenance. They self-cool, so you only need to keep the displays free of debris. We offer integrated data connections (plug in an ethernet cable directly from the computer) as well as wi-fi antennas with a range up to 1.5 miles (with clear line of site, meaning no trees or buildings in the way between antennas). Wi-fi access means you do not have to dig up your parking lot or established landscaping to control your new LED panels. You have the ability to upload images, text in any font, and even videos! Our LED panels have a (5) year warranty with an expected 20,000 hour lifespan. Call us for a quote. You will find we offer the highest resolutions at the best prices, and our LEDs are made in the USA with USA tech support. • P-10: P is for pitch, meaning the distance in millimeters between each pixel. Note: P-10 is a BETTER resolution than a P-16. Because the pixels are closer together, you get more pixels (or higher resolution) in the same size area. • Full-Color: 1R 1G 1B – one red, one green and one blue LED crystal in a triangle to make a single pixel (industry standard). Your TV at home is in RGB as is your computer monitor. • Power Supplies: Our power outlets are 120v, but LED pixels only require 5v to operate. This is why they are so energy efficient! All LED message centers have built-in power supplies that transform 120v to 5v, then power each of the divided LED modules in the matrix. We do not overload power supplies by making one power supply power all grids, but rather split the electrical load over multiple power supplies to make the cabinets electrically solid and sound. Call us toll free (800) 735-7209 for questions. We have fine-tuned every aspect of made-to-order LED signs. You will be in touch with an experienced sign designer, seasoned in cost-effective solutions. We listen to your needs and deliver! Our team will walk you through every stage, from design to installation, making the entire process simple and rewarding. Our team is a collaboration of artists with decades of experience in the dimensional, electronic signage and monument industry. Your project suited to your needs. We will provide you with the most dynamically designed signage solution. We will help you to brand the individuality of your company or property. Custom LED signs provide a sense of distinction and permanence to your property. Our sign monuments are the style most desired and required by municipalities nationwide for an all over better looking community. With over (2) decades of nationwide success, we will make You Look Your Best! We welcome any challenge in LED signage. Please use our online contact form to start your next sign project. We look forward to working with you! This entry was posted in Business Signs, Commercial Signs, Completed Sign Projects, LED Sign Projects, Monument Signs, Property Developer Signs by BSM Staff. Bookmark the permalink.